GSOFT doesn't just wish their employees health and happiness in January. They offer it to them – and all year long. Simon De Baene, the CEO and co-founder of GSOFT, insists: employees are the most crucial element in his software engineering company, which is one of the most important SMEs in Quebec. “Happiness at work is the key to success. When you can bring together a truly motivated and tight-knit team on a given project, you can do great things”, stated the young thirty-year-old CEO in a phone interview. Not only do they encourage their staff to eat better and incorporate physical exercise into their daily routines, they also uses various strategies to reduce stress and improve well-being. Their workers seem to appreciate the effort, given that the GSOFT’s turnover rate is only 5% (in 2011, in Quebec’s high-technology sector, this rate was 23% according to Emploi-Québec). Of course, GSOFT itself benefits from their employees being physically fit and healthy, and therefore being capable of giving their 110% at work - but the company chooses to go the extra mile because being healthy makes you happy. This is why the company has hockey and cosom hockey teams as well as an upcoming baseball team, has installed a skateboard ramp in its office, in addition to incorporating a game room and a room with mattresses to take naps. As a bonus, they offer a FitBit fitness tracker to their new recruits as well as $1,000 to spend in sports-oriented expenses per person, be it for purchasing equipment or for memberships. GSOFT also offers their employees healthy breakfasts every morning (with fruit, yogurt and granola from OatBox) as well as healthful lunches three times per week, which are provided by a caterer. As for working spaces, they are open and well-lit, equipped with ergonomic chairs and a few standing desks in addition to regular desks. But there's more. Because while physical health is important, mental health is no less crucial. It has been proven: being in good company and having the feeling of belonging to a community is an indicator of good mental health. For Christmas, no boring dinners at an impersonal restaurant: everybody goes on a trip together for four days. This year, it was a cruise to the Bahamas, after Las Vegas, New York, Miami, Punta Cana and Cuba. “We organize activities that bring together employees who do not usually work with each other. When we return to the office, everyone is well-acquainted with each other, everybody feels a little bit at home. The feeling of belonging is strengthened.” Therefore, the atmosphere in the company is very friendly, peaceful and positive. Riding on the wave of a vigorous team spirit, productivity reaches new heights. All in all, employees’ health and happiness is not just an expense: it's an investment. 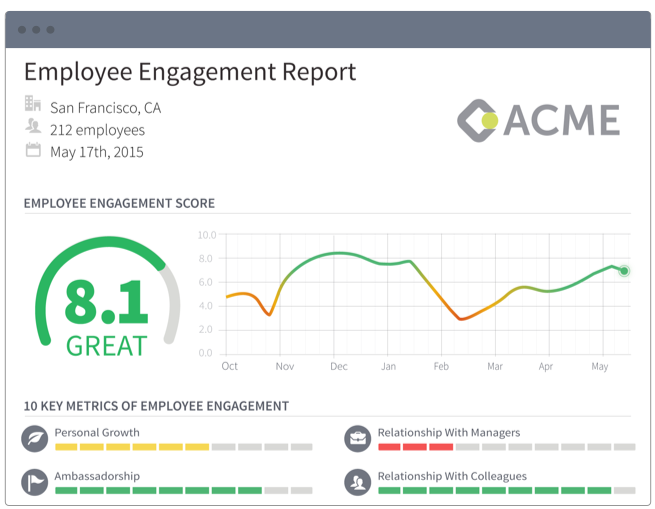 GSOFT has created Officevibe, a software program used by Disney, among others, that allows companies to measure and analyze their employees’ level of happiness and engagement in order to be able to take action as needed. Dialogue is a mobile platform that gives companies access to the best health professionals so that their employees are be happy, healthy and productive.